We combine a top-tier digital app for everyday use with live on-site services to provide end-to-end wellness and communication. Completely customizable, from functionality to appearance. Mix-and-match features to perfectly suit employees' needs, by office, team, or individual. A fully white-labeled app fits seamlessly into your organization. We’re on the ground in cities across the US, and our digital platform is accessible anywhere - iOS app, Android app, and mobile/desktop web browsers. Refresh has over 30 on-site offerings from Nutrition Coaching to Lunch & Learns, Kickboxing to Yoga, and everything in between. Select the perfect combination of services to build your program - we handle everything else. 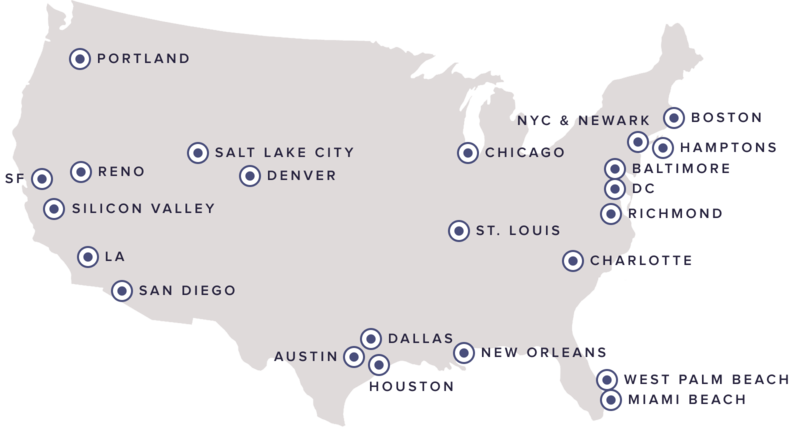 We're in 25 cities in the US and can launch new locations in less than 3 weeks. Registration and coordination is all handled through the app. We handle payments and co-pays for premium services, and you can even conduct polls for event attendees. Our in-house series guides employees through basic movements they can do at their desk to alleviate stress, fitness routines, guided audio meditation - even financial wellness, in a series from Fidelity™. Encourage healthy eating habits. Employees learn incremental ways to change their diet and what to eat when dining out, and track nutrition across meals. 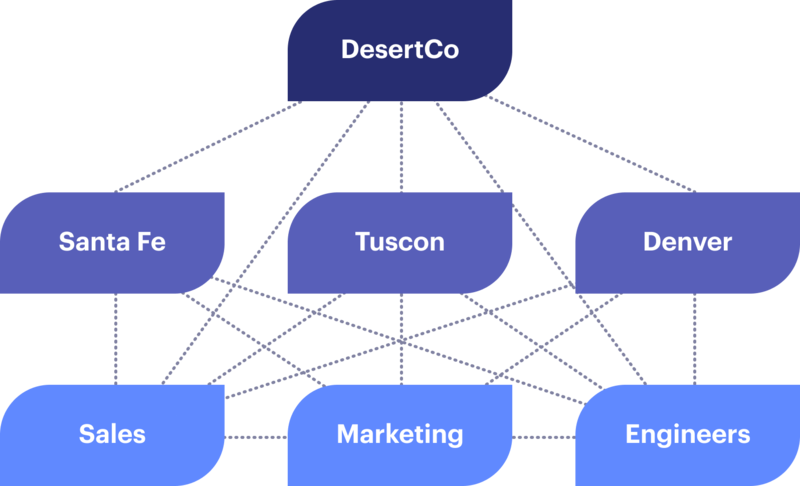 A single location for marketing and registration across affinity groups, on-site Refresh classes, philanthropy projects, community events, and anything else your company offers employees. 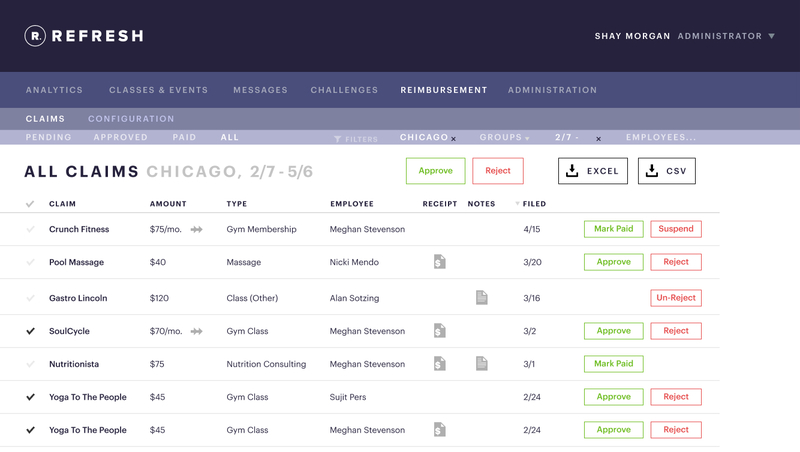 Run event ticketing, employee polling, and more through our scheduling tool. Communicate with individual segments of your employee population globally through push notifications, text messages, and emails. Target specific populations easily with the help of our backend data and analytics. ...send out a targeted notice to your Minneapolis office to everyone who recently attended a class. ...let the Cleveland accounting team know about the upcoming team bowling event and have them sign up. 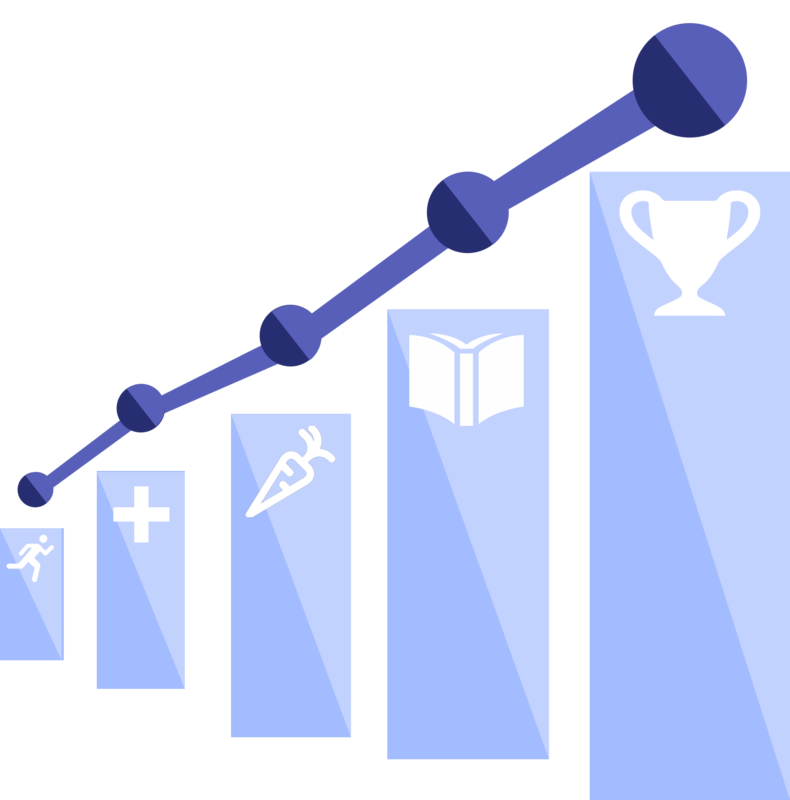 Incentivize participation across the platform with Refresh Challenges. Reward employees for watching videos, completing e-learning, or reading daily notices; jump-start exercise and promote heart health with step tracking, wearables (FitBit, Apple Watch), and Cardiogram™ integration; run competitions in fitness or learning tasks across teams. 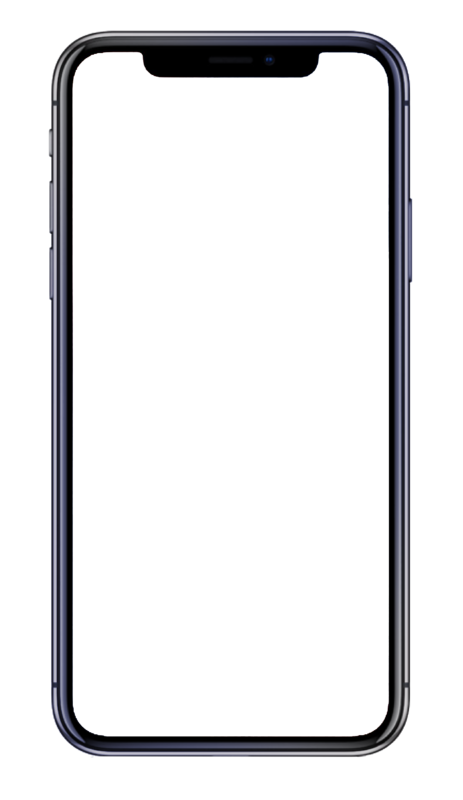 What’s covered? What’s not? This common employee question is answered in our integrated health care plan tool, which connects directly with your insurer and provides plan details, ID card-to-wallet, and contact information. Many employers provide reimbursement for self-directed wellness expenses such as gym memberships, smoking cessation, nutrition counseling, and more. Refresh facilitates expense submission and tracking, and manager tools handle the fulfillment workflow. Offer discounts through local retailers. Gift game-day tickets for sales goals or birthdays. Tie rewards to completed Challenges to drive participation. Along with a partnership with RewardJet™, the Refresh Rewards engine can co-exist with or jump-start your employee rewards program. 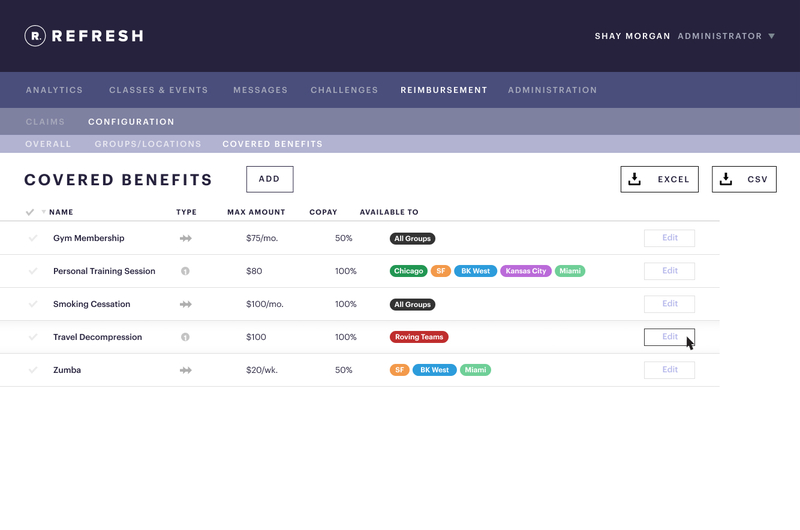 Every aspect of the Refresh platform is built around a segmentation structure that is configured to your organization. Target employees based on locations, groups, teams, and roles. Want to offer Acupuncture to your Facilities team in Oklahoma City? Send a 4th of July bonus message to Sales in Seattle? It’s all possible with Refresh. 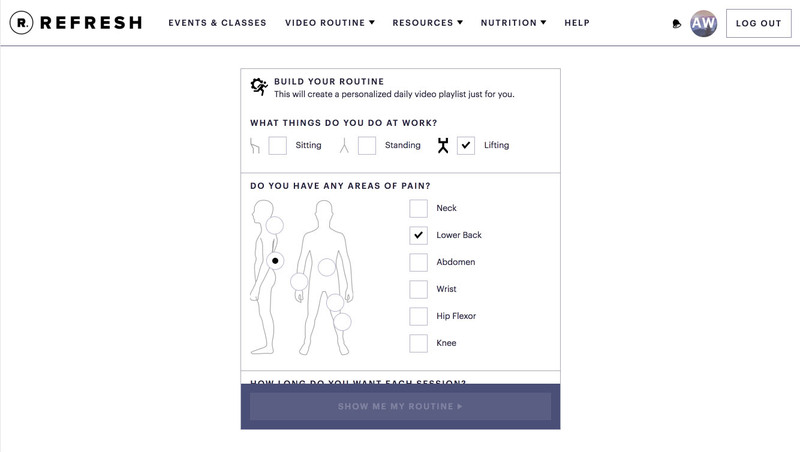 The Dashboard features a rich analytics tool for fine-tuning your wellness amenities and communications. See who’s joining what, watch for seasonal changes, and track app usage across segments. Export any information you’d like to CSV, Excel, and PDF formats. Refresh is a multi-platform, multi-department solution, and our messaging tools reflect this diversity. 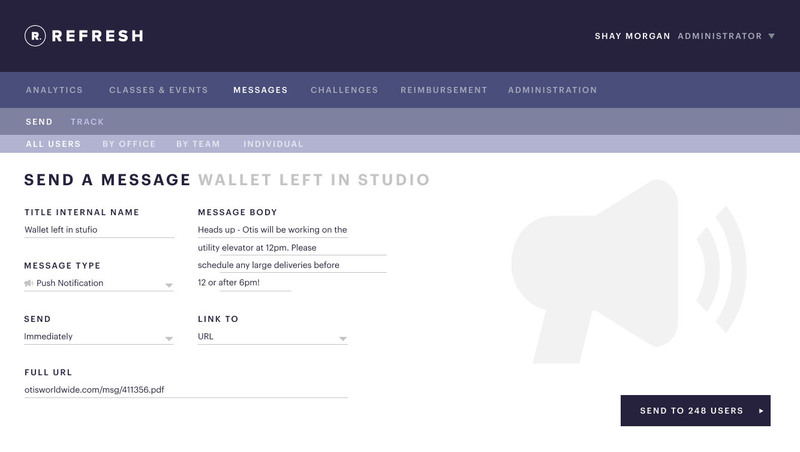 Send rich templated emails to office employees or text messages to workers in the field. Send push notifications directly to phones for higher engagement rates. Track messages sent and re-use message templates across segments. Manage and segment poll responses and take action to customize events and other programs to give employees what they want. Handle the fulfillment workflow for wellness and other expenses. Mark in review, approved, paid, rejected; add notes and comments. Coming soon, pre-process expenses automatically with Amazon Mechanical Turk. Thank you for your interest in Refresh! We're happy to give you more information.